In 1909, twenty-year-old Miguel Augustin Pro joined the Jesuits as a novice in Mexico. A year later a revolution erupted and by 1914 the Jesuits were forced to flee. Via Texas, California, Nicaragua, and Spain, Miguel received his seminary training en route to Belgium, where he was ordained in 1925. We carry on like slaves. Jesus help me! There isn’t time to breathe, and I am up to my eyebrows in this business of feeding those who have nothing. And they are many—those with nothing. I assure you that I spin like a top from here to there with such luck as is the exclusive privilege of petty thieves. It doesn’t even faze me to receive such messages as: “The X Family reports that they are twelve members and their pantry is empty. Their clothing is falling off them in pieces, three are sick in bed and there isn’t even water.” As a rule my purse is as dry as Calles’s soul, but it isn’t worth worrying since the Procurator of Heaven is generous. People give me valuable objects to raffle off, something worth ten pesos that I can sell for forty. Once I was walking along with a woman’s purse that was quite cute (the purse not the woman) when I met a wealthy woman all dolled up. I see God’s hand so palpably in everything that almost—almost I fear they won’t kill me in these adventures. That will be a fiasco for me who sighs to go to heaven and start tossing off arpeggios on the guitar with my guardian angel. In November 1927, a bomb was tossed at Calles’s car from an auto previously owned by one of Miguel’s two brothers. All three brothers were rounded up and condemned to death. The youngest was pardoned, but Padre Pro and his brother Humberto were executed by a firing squad. Calles had news photographers present, expecting the Pros to die cowardly. 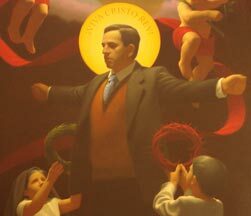 But Padre Pro refused the blindfold and welcomed the bullets with his arms extended in the form of a cross, crying out, “Viva Cristo Rey!” Although Calles outlawed any public demonstration, thousands of Mexicans defiantly lined the streets, honoring the martyr as he was carried in procession to his grave. Excerpt from Voices of the Saints by Bert Ghezzi. Image courtesy Shrine of Our Lady of Guadalupe, La Crosse, WI. Brief video overview of Pro’s life, from the Catholic News Agency.